Once the coordinates were received, the two A-10s immediately pointed at the location, pressing toward it as fast as they could. Oiler’s jet was a bit of a pig, so he was trailing his wingman by a distance of almost eight miles. The throttles were at the stops, demanding as many knots as the airplane would give him. The pilot reached to his lap, grabbed the NVGs and popped them into place in front of his eyes, switching them on. He was really concerned. From what the command and control element had passed, the situation on the ground was dire: American troops in four different locations inside a small town, their positions not clearly marked, and under a coordinated Taliban attack. They were under fire from three different directions, already taking casualties. Comms with the ground position thus far had been lousy, the jets were low on gas, and the bad guys were closing in–a recipe for disaster. 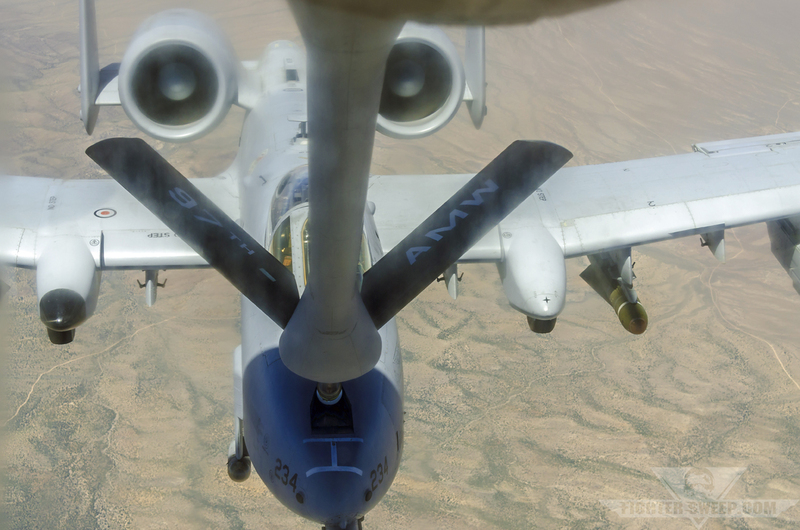 A Republic A-10C Thunderbolt II, affectionately known as the “Warthog,” takes on fuel from a KC-135 Stratotanker during a Close Air Support mission. Within moments, the two A-10s were back in a tactical formation, screaming in toward the target area at tree-top level. Each aircraft was loaded for bear: a targeting pod, AGM-65 Maverick missile, a pair of Mk 82 “dumb” bombs, and two GBU-12 laser-guided bombs, plus all the rounds they could carry for the monstrous GAU-8/A “Avenger” thirty-millimeter gun in the nose. Each of the seven barrels in the cannon was nine feet in length, delivering the ammunition at a rate of four thousand rounds per minute. The first pass over the target area would be a show of force; it would give the two pilots an opportunity to get their eyes on where the enemy fire was coming from, as well as give the bad guys the opportunity to scatter. More often than not, at the first sound of an A-10’s high-bypass turbofan engines, the enemy would head for the hills — literally. They didn’t want any part of the Warthog. It would inevitably mean their death. The Green Flag mission begins long before tactical training operations occur on the simulated battlefield. The 549th CTS planners design the exercises with Army planners six months before forces arrive to begin their maneuvers. Air Combat Command determines which and how many flying units will participate, then the planners at Nellis and Fort Irwin work with those commands to build up an integrated plan to maximize joint and individualized unit training objectives. 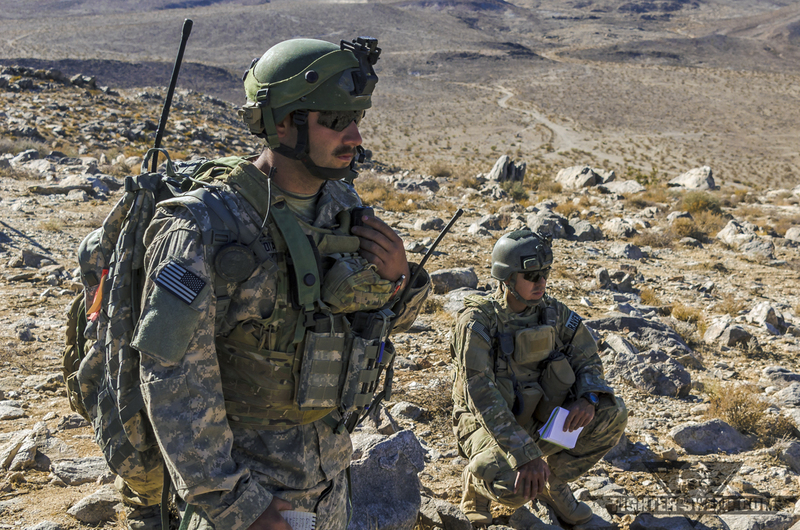 An Army Ground Liaison Officer (GLO) and Air Force JTAC listen to a pair of F-16s from the Alabama Air National Guard during a Close Air Support training mission at Fort Irwin, CA. For this particular session of Green Flag, unprecedented access was offered by the participating units, allowing FighterSweep to get a feel for how airpower is being employed in the CENTCOM theater of operations. Participating units were the 55th Fighter Squadron in their F-16s from Shaw Air Force Base, South Carolina, and the 75th Fighter Squadron in their A-10s from Moody Air Force Base, Georgia. On the ground was the 3rd Brigade Combat Team, 2nd Infantry Division at Fort Lewis, Washington. All told, 250 Air Force personnel were supporting nearly six thousand Army troops. No small feat. 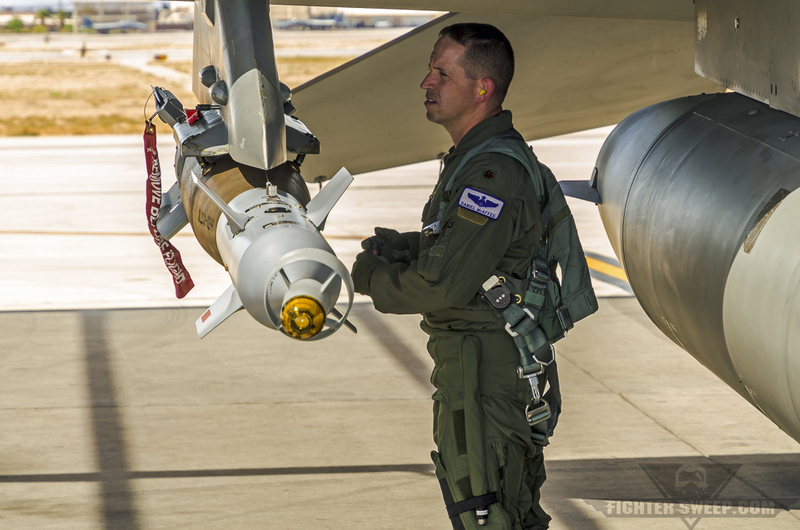 Major Daniel “Tank” McAffee, F-16 pilot with the 55th Fighter Squadron from Shaw AFB, SC, checks the pylon holding a live GBU-12 Paveway II laser-guided bomb prior to launching for a Green Flag-West training mission over Fort Irwin, CA. At the end of the day, the success or failure of this type of training in measured in lives—both those saved and lost. The relationship between the pilots and JTACs is the wildcard, and the better that relationship is, the more likely that the bulk of the outcomes will be positive. 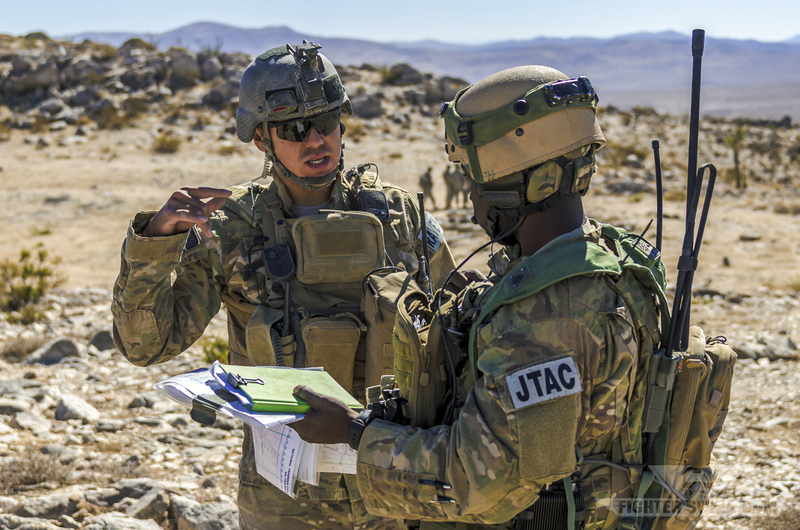 Two Air Force JTACs discuss mission parameters prior to calling in CAS for an exercise during Green Flag-West. A great example of how symbiotic the relationship between pilot and JTAC is happened on training day four, where the JTACs saw a surface-to-air missile launch and called out a warning over the radio. The pilots in their F-16s actually did not see it because they had just turned away from the target area, and they ended up releasing a volley of flares as countermeasures to defeat the infrared missile. The JTAC at that point was responsible for saving the lives of aircrews, too. It truly goes both ways. In the next installment, FighterSweep continues to illustrate the importance of good integration between air and land assets, and what a real-world CAS mission looks like when all the pieces come together. We’ll be right back!